The Central Bank of Nigeria (CBN) yesterday injected another sum of $210 million into the interbank foreign exchange market. Figures released by the CBN indicated that authorised dealers in the wholesale segment of the market received the sum of $100million, while the small and medium scale enterprises (SMEs) and the invisibles segments were allocated the sum of $55 million each. The Director, Corporate Communications Department at the CBN, Mr. Isaac Okorafor, confirmed the figures and restated the Bank's resolve to always meet the request of genuine customers in the various segments of the market. The Bank had last Friday injected a total sum of $289.76 million into the retail Secondary Market Intervention Sales (SMIS) and CNY38.70million in the spot and short-tenored forwards of the inter-bank foreign exchange market. 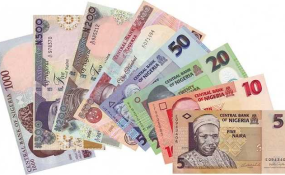 The naira sold at N360 to a dollar on the Bureau De Change (BDC) segment of the market.